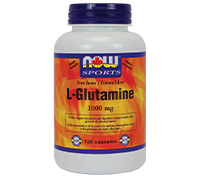 Glutamine has recently been the focus of much scientific interest. A growing body of evidence suggests that during certain stressful times, the body may require more glutamine than it can produce. Under these circumstances Glutamine may be considered a conditionally essential amino acid. Suggested Use:As a dietary supplement, take 1 capsule 1-3 times daily, preferably with meals. Free of:sugar, salt, starch, yeast, wheat, gluten, corn, soy, milk, egg or preservatives.